Want to help us take it to the next level? Join our Coaching Staff! 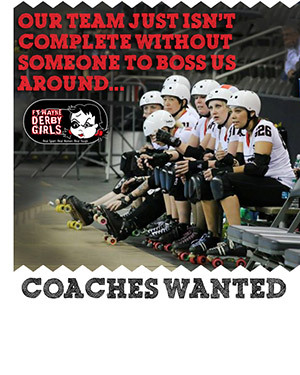 We are looking for experienced coaches who are ready to dive into the fast paced world of roller derby. Fill out our coaching application and email it back to us (fwderbygirls@gmail.com) by July 31st if you are interested in being a part of FWDG! Roller derby knowledge encouraged, but not required. Coaching experience preferred, but not required for the right candidate. Willingness to learn the rules and regulations of Women’s Flat Track Derby Association (WFTDA). Ability to be a strong leader and manage a team in a positive, inclusive, and encouraging manner.